I hate to say but if you haven’t had a knack for building blocks, than you are probably missing out a large chunk of the fun out there. LEGO has been making waves after waves throughout the past few years. The toy company had been very active in their marketing efforts and you would probably have witness a few memorable LEGO marketing campaigns and publicity stunts. Earlier on this year, I reported an awesome installation where LEGO installed their beautiful building blocks on the subway of London. They used their blocks to form the iconic train map of the London subway. Today, we see that imagination is limitless when it comes to a product so basic, so elementary in nature that one could almost create any possible form of invention out of it. 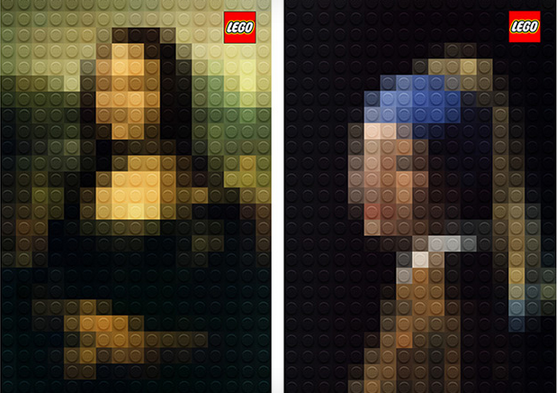 With LEGO, we can even create art. Pure art. Italian designer, Marco Sodano created the famous masterpieces of Da Vinci’s Mona Lisa and Lady with an Ermine, alongside Vermeer’s Girl with a Pearl Earring and showcased them on his Behance page. I must say I am quite fond of his works, not forgetting he also has a certain flair for writing. The tagline for the page where he displayed the works, wrote “all the children are authentic artists”. Amazing ideas like this can be used for many creative purposes. Personally I am a big fan of LEGO, and I absolutely concurs that the toy not only stimulates creativity, it brings along happiness along with it.